Often we get asked the same question: “what’s our favorite destination”. Being lucky to have traveled to over 5o countries the answer is never easy. There are too many incredible places on this earth and each one has touched our hearts for different reasons. 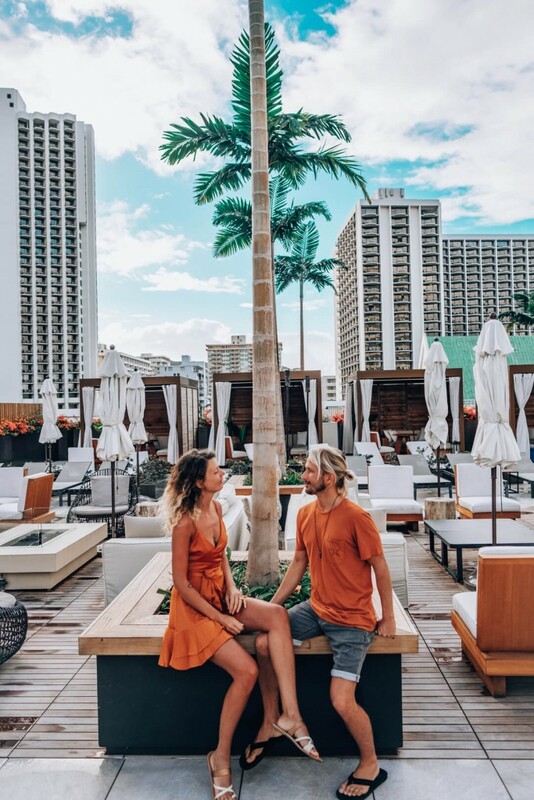 But, if we can narrow it down to a few, Hawaii is one our top favorite, no doubt about it. We are so blessed to have visited this paradise numerous times and every time feels like the first. We are in complete awe from the moment we breathe in the tropical air and feel the warm breeze on our faces. It’s like there’s something magical in the air, maybe it’s the Aloha. The last time we came to Hawaii was about 5 years ago, so we were way overdue for a visit. 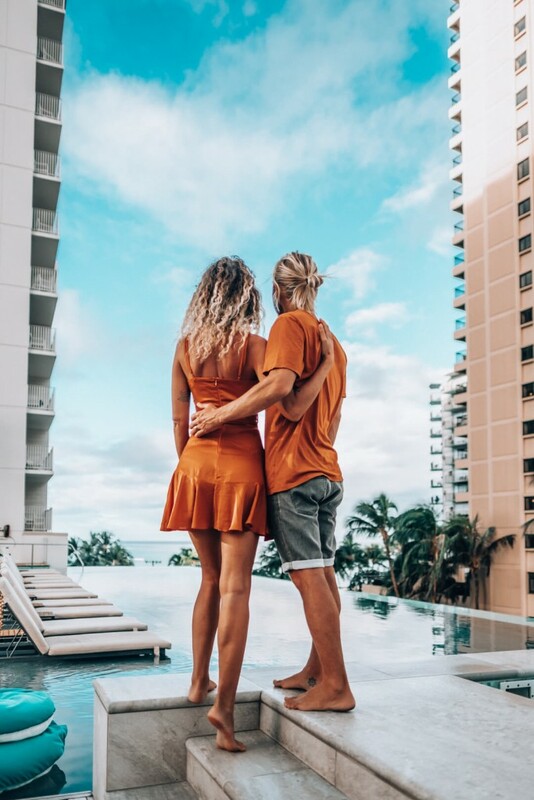 So spontaneously when Mikey had an expected week off, we literally booked a last minute trip to Oahu. And honestly, some of our best trips have been the ones that we didn’t plan in advance. 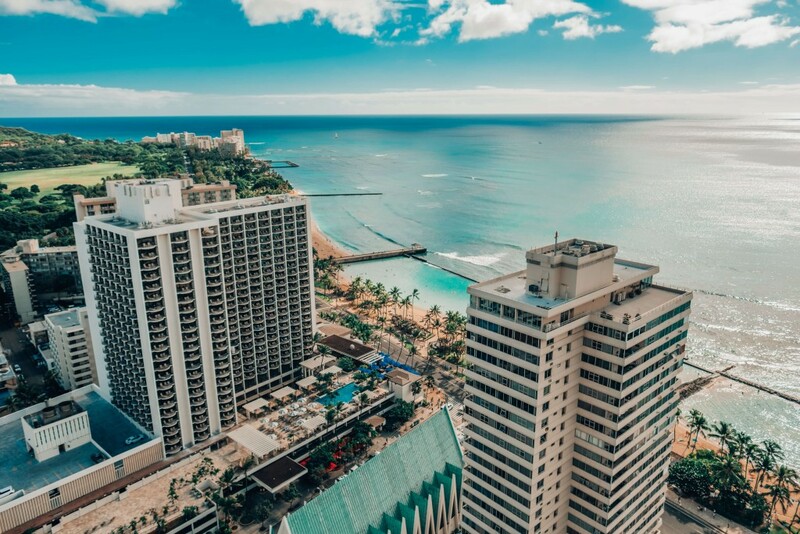 Oahu is the most visited and diverse of the Hawaiian Islands. There’s so much to see and do that one week is not enough. 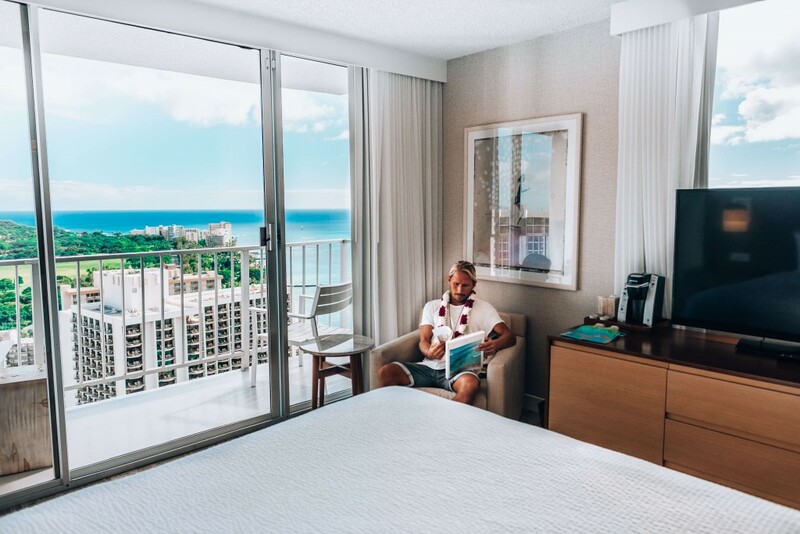 We decided to split our stay between spending some time at the North Shore and the very famous Waikiki. 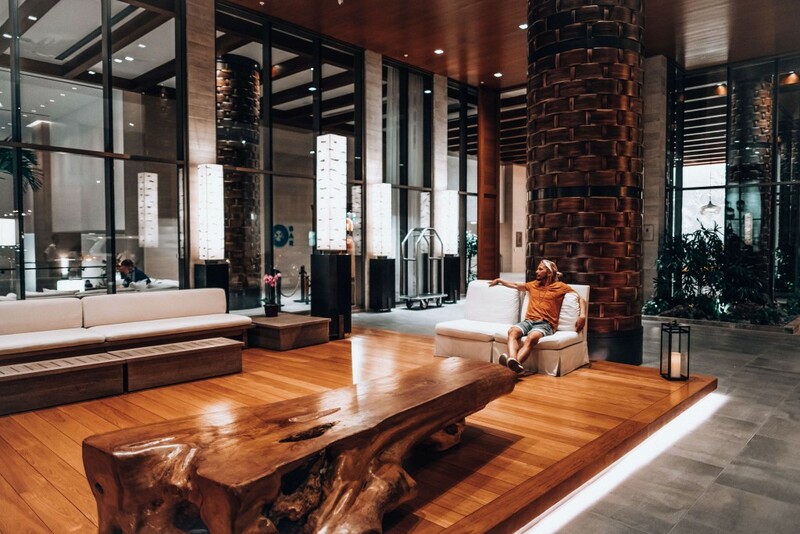 Finding the right place to stay sometimes can be overwhelming so we picked our favorite and in this post we will share it with you. Situated in the heart of busy Waikiki, Alohilani Resort offers an invigorating harmony of outdoor luxury and sophisticated tropical oasis. 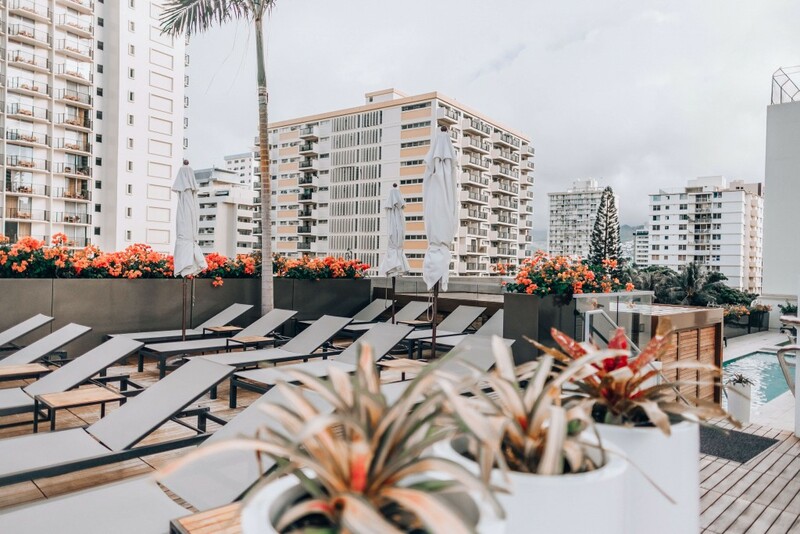 Located right in front of the most famous shoreline in the world, Waikiki Beach, Alohilani Resort is the new hot spot to stay in Honolulu, Hawaii. 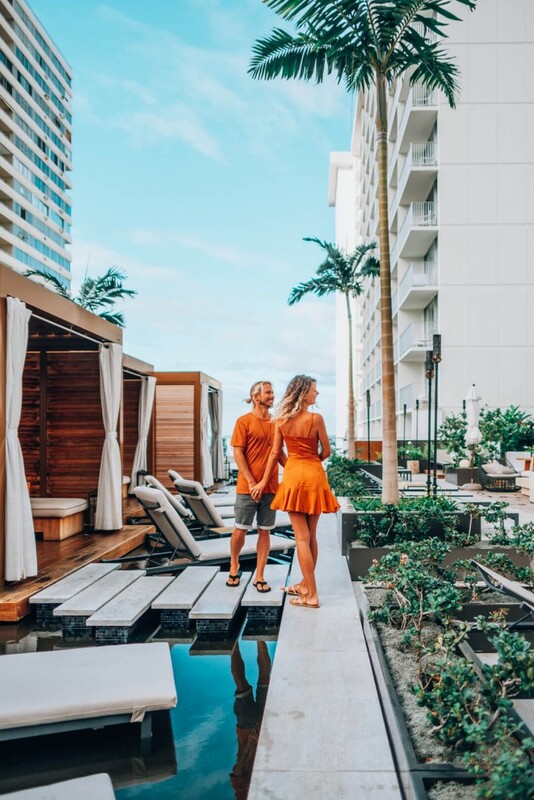 This modern oasis embodies the rich Hawaiin culture combined with chic design, Aloha hospitality, and an unforgettable experience. 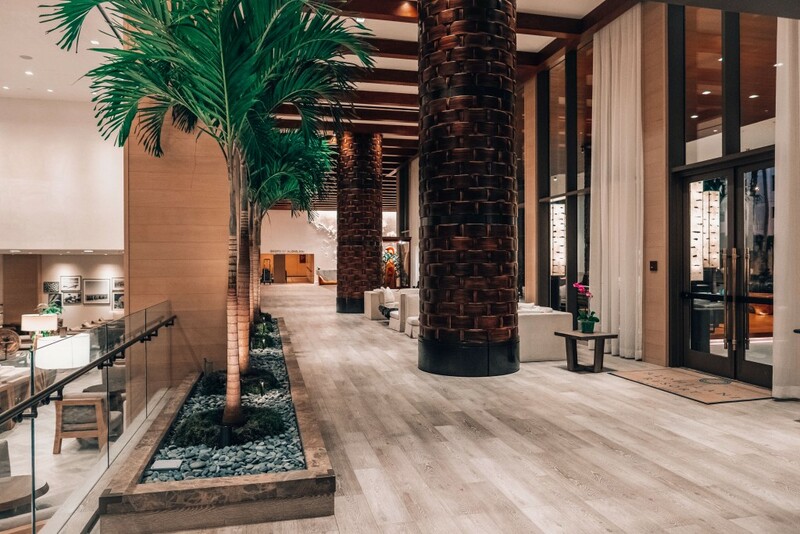 From the moment of our arrival, we were captivated by the striking lobby with an open floor plan, towering windows walls and eye-catching pillars wrapped in basket-woven teak. 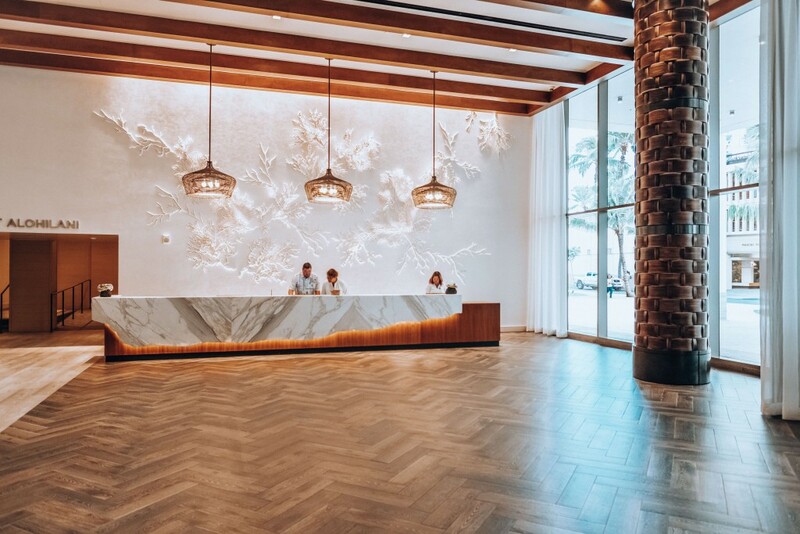 One of the highlights of the lobby is the mesmerizing white coral wall sculpture named “MAKAI” right behind the reception desk. 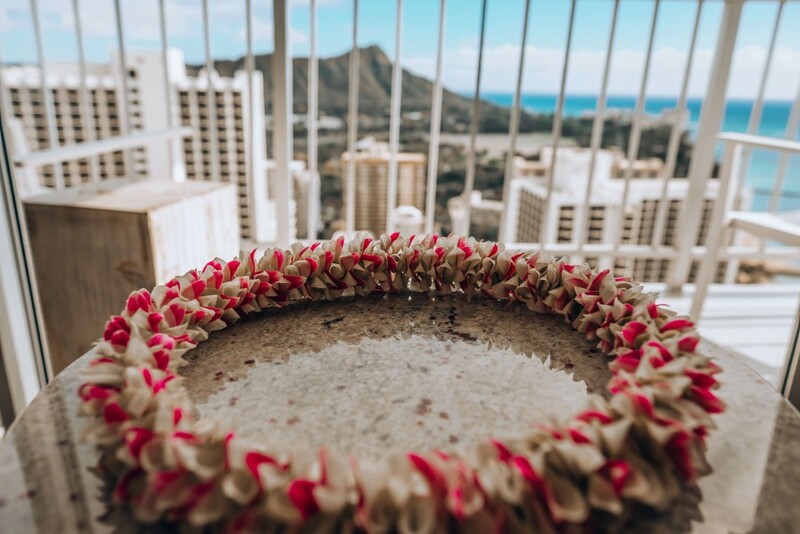 We were welcomed with true Hawaiian hospitality, a fresh flower lei, and a warm “Aloha!” The check-in process was easy, fast and we were given a Diamond Head Ocean view room on the 37th floor. We are both coming from a long background in the hospitality industry and customer service is very important to us, so the staff at Alohilani Resort didn’t disappoint. 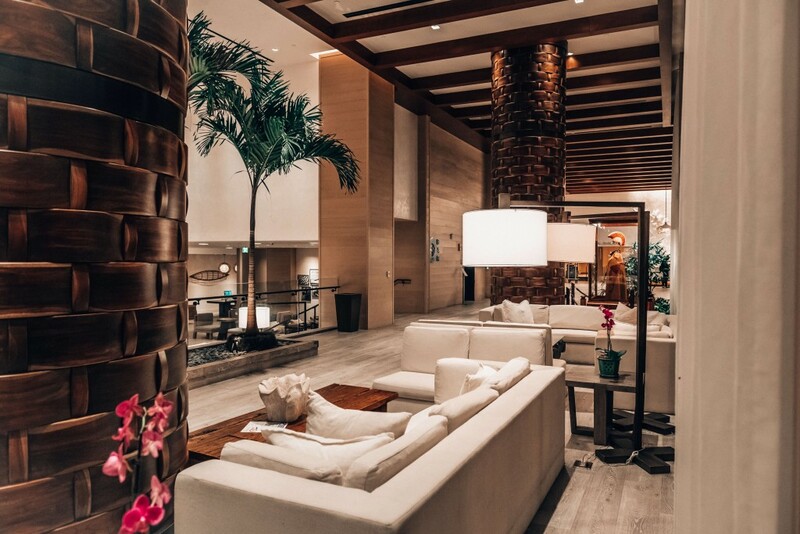 Each and every member provided an outstanding service and made our stay even more memorable. 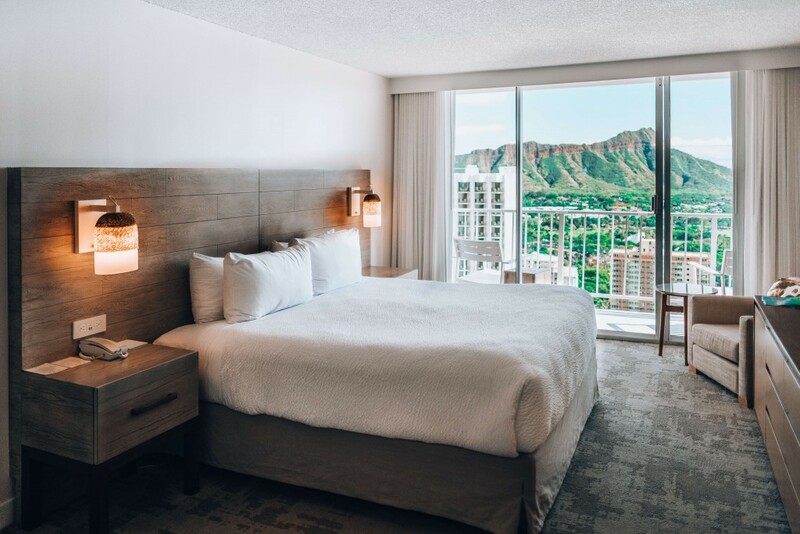 The all-new 839 rooms and suites have private balconies with either Diamond Head, ocean or city views. Our room was all natural and earthy colors, decorated with modern taste incorporating the main colors of the island, white, beige, blue and green. Every room and suite features Malie Organic’s Koke’e scented bath products and custom blended coffee. We have to admit that the view from our patio was jaw-dropping. We had so many moments thinking, is this even real? 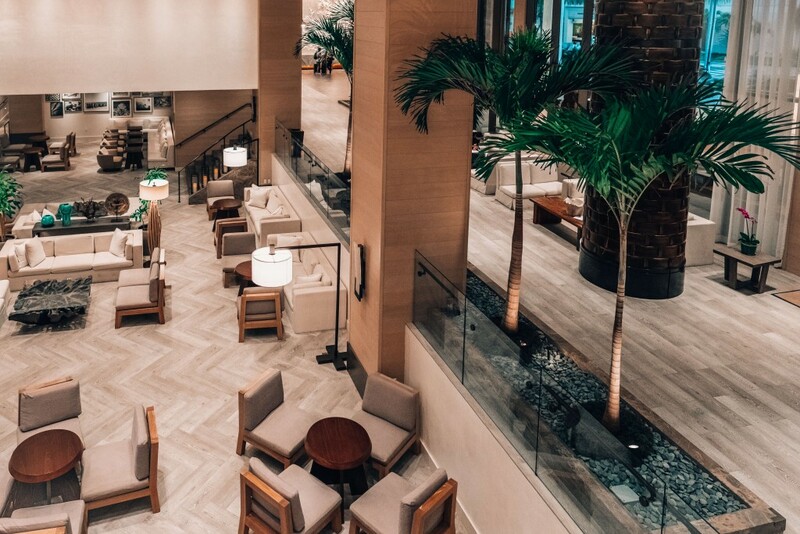 The hotel’s O Bar overlooking a three-story Oceanarium is a relaxed gathering place and offers ocean-inspired craft cocktails, local beer, wine, and small plates to snack on. 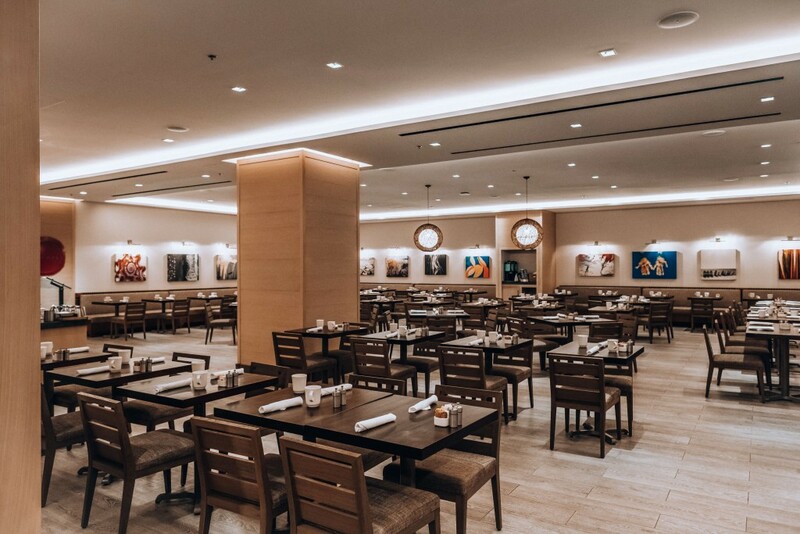 Evenings, you can find live music and great ambiance. 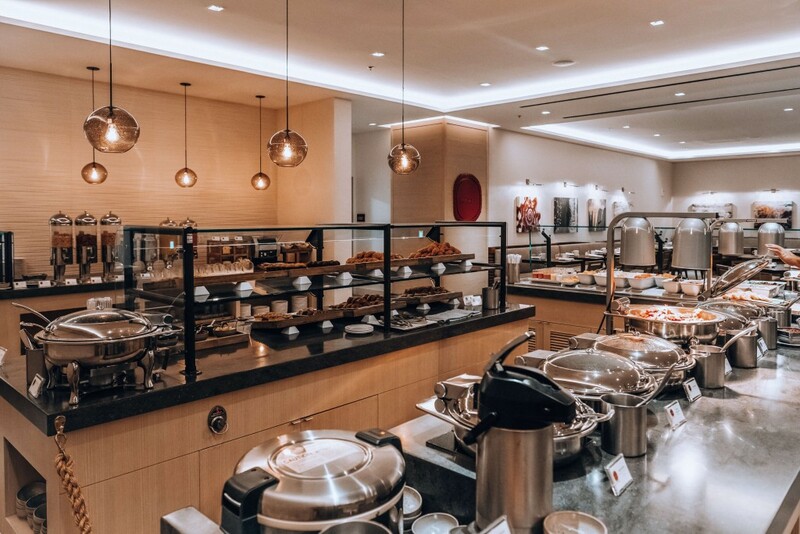 One level up is Lychee, the breakfast buffet where each morning you can enjoy delicious local dishes and with fresh island fruits and great service. 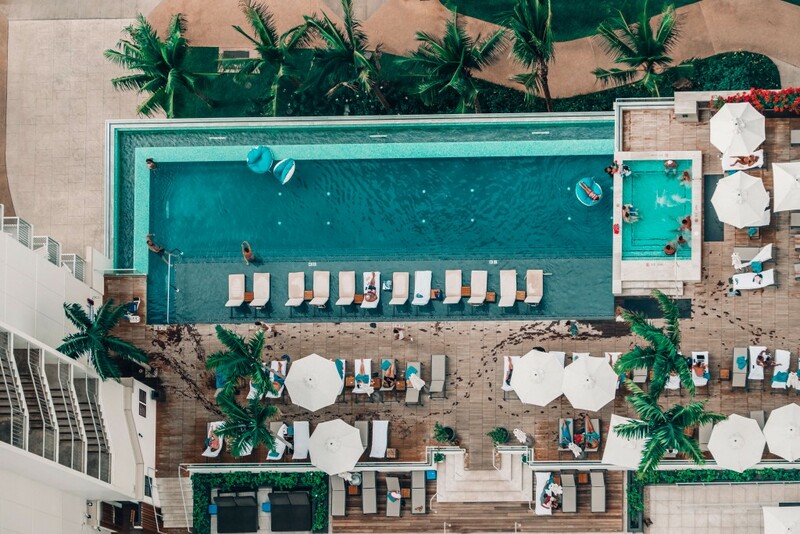 Our favorite part of Alohilani Resort was definitely the fifth floor, where the extraordinary Swell Pool & Bar is. 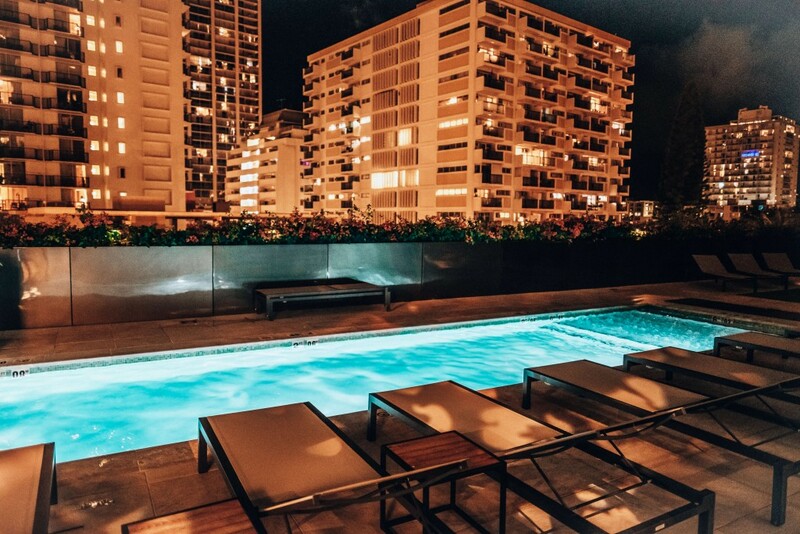 It’s a real tropical oasis where you can rent your own private cabana and enjoy the saltwater infinity pool overlooking Waikiki beach. 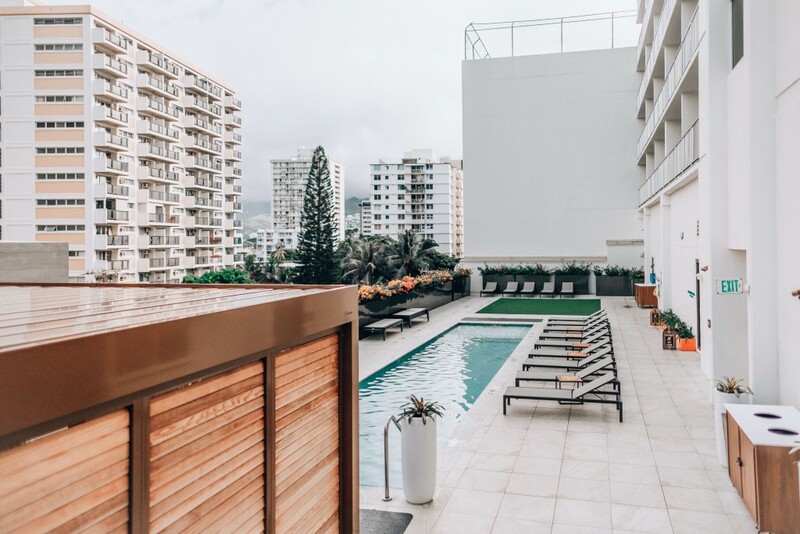 On this luxurious pool deck, you have everything you want and you could totally spend your whole day there, you will forget that time exists. While taking dips between the pool and the hot tub you must definitely enjoy some of the crafted cocktails. 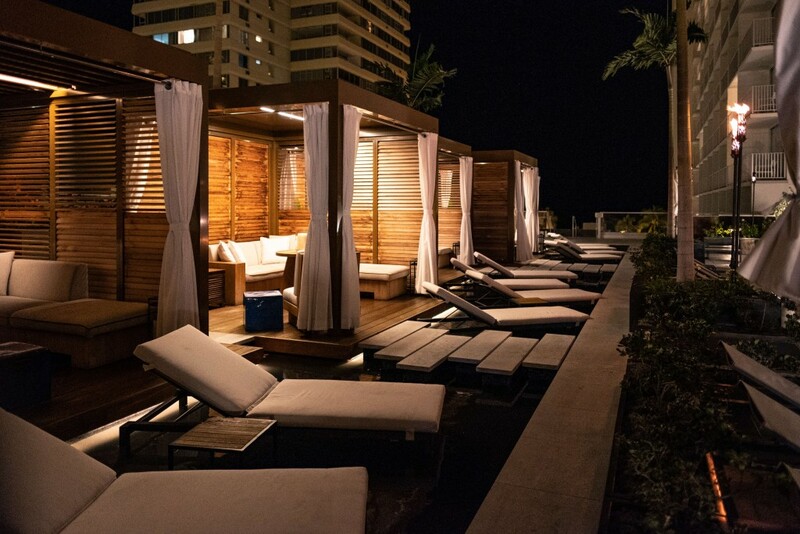 At night time the Swell Pool & Bar shifts to a lively evening hot spot with music, fire pits and much more. 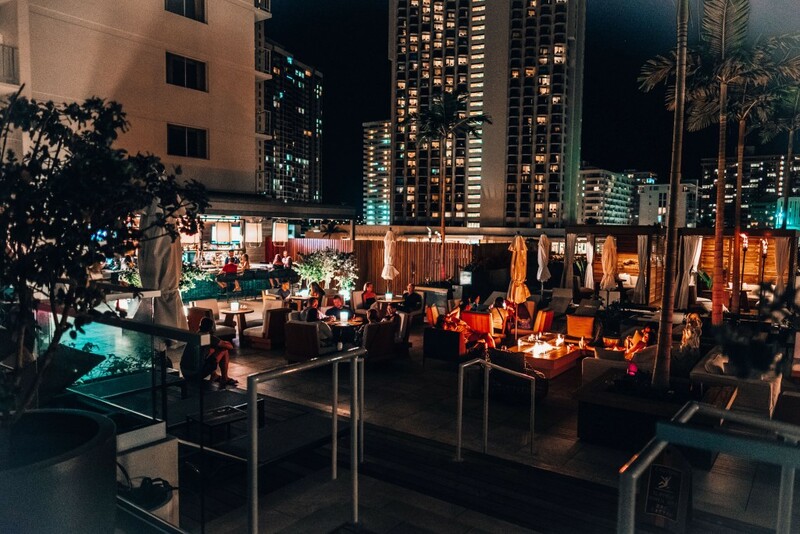 It’s definitely the place to meet with others and enjoy the night city views. Alohilani Resort also offers a Monkey Pod Kid’s Club with its own pool, games and evening movies. 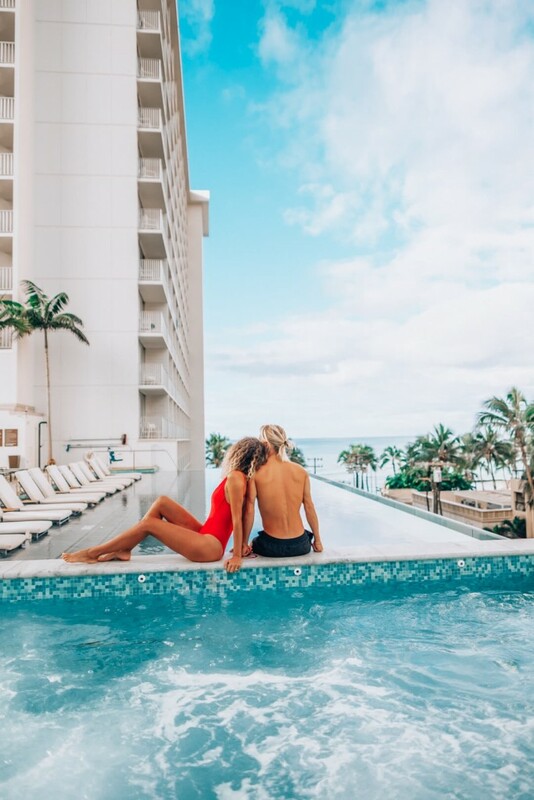 For all the health and wellness folks like us, Alohilani Resort has the Island Club and Spa. 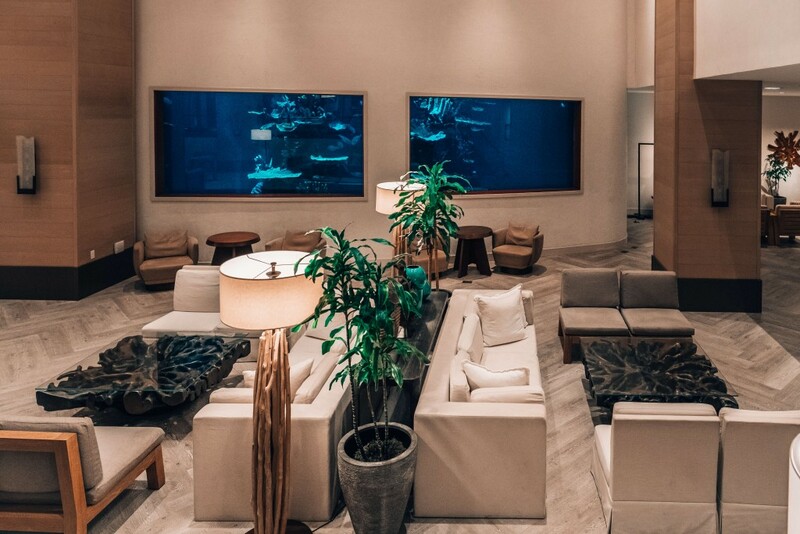 There you can find, three treatment rooms for massages, body treatments, and facials. Also, you can find tennis courts, TRX, yoga studio, and a gym. 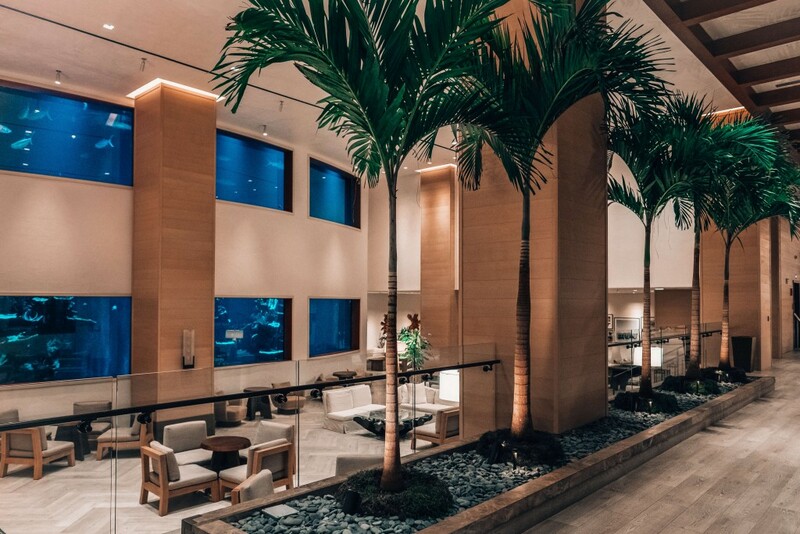 For a fine dining experience, the resort features the premier restaurant, Morimoto Asia Waikiki. 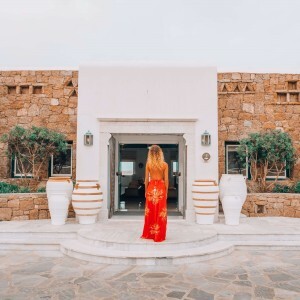 It overlooks the ocean and there, you can indulge in delicious meals infused with Western and traditional Asian ingredients. We hope you enjoyed reading this post and we would be happy to answer any question that you may have about Oahu and our stay at Alohilani Resort. Please leave us a comment and your thoughts bellow. 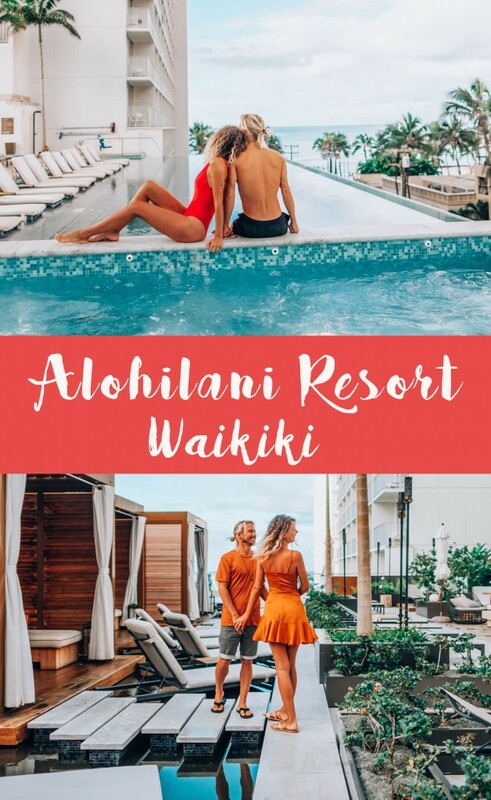 *Disclaimer: Our stay at Alohilani Resort was complimentary, but all the opinions and views presented here are entirely our own and true. I would have to agree that choosing the best or favorite destination is just challenging. Though I have to admit that Hawaii is definitely included on my Top 10. This resort looks really nice. We will definitely consider this during our next trip. This looks like it would be such an amazing experience. 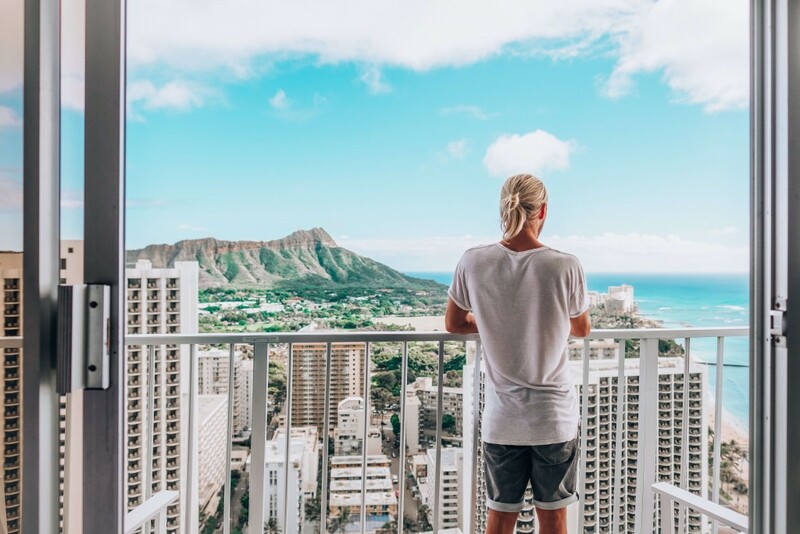 Travel to anywhere in Hawaii is definitely on my bucket list! First of all, I love all your pictures! This place looks so amazing! 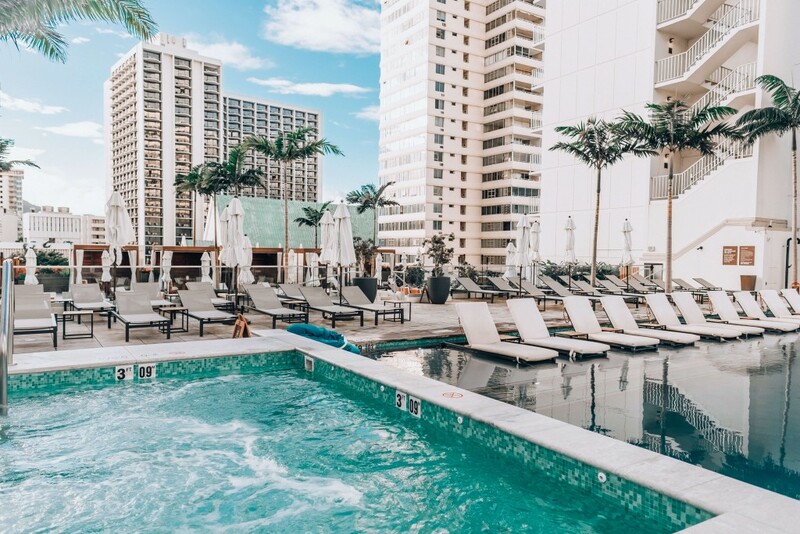 The Swell Pool & Bar looks like the definition of the word relaxing. Wow, this place looks beautiful! I would love to visit Hawaii and stay there. That pool is amazing! It seems like an incredible place to stay on a vacation. This places is making my heart palpitate with excitement. 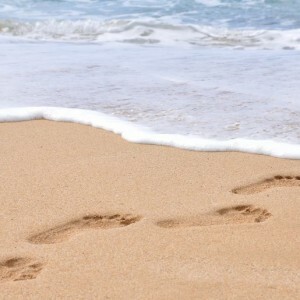 I love luxurious appeal and vacation near the sea. Ah fantastic! The hotel is pretty awesome and the location is perfect. everything you will need the there beach to pool beautiful hotel food and the view absolutely package. It does look like a beautiful resort there. It’s been so long since I have been out to Waikiki. But it was an amazing experience when I was there. 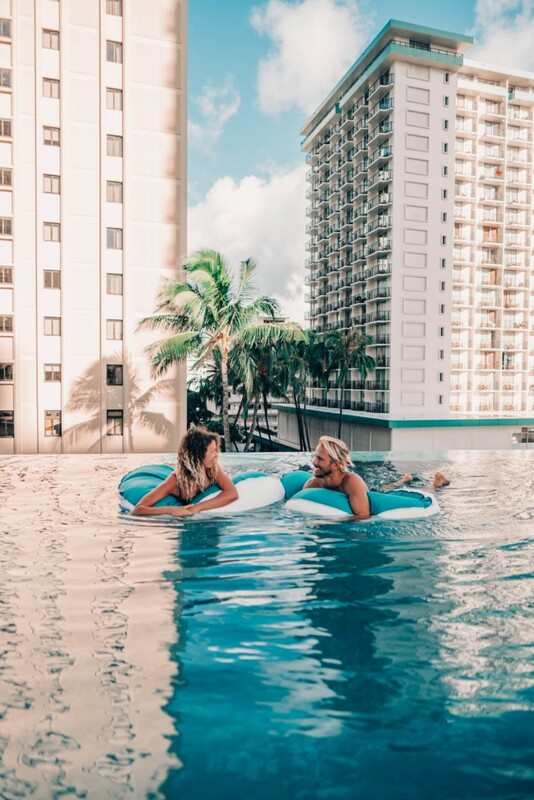 I think I’d rather be out on the waters of Waikiki beach than the indoor pools, no matter how beautiful they are. I will have to consider this place the next time I am out in Waikiki though. What a beautiful resort. The room looks spacious and nicely decorated. I love it. Great review here. WOW, this is stunning! 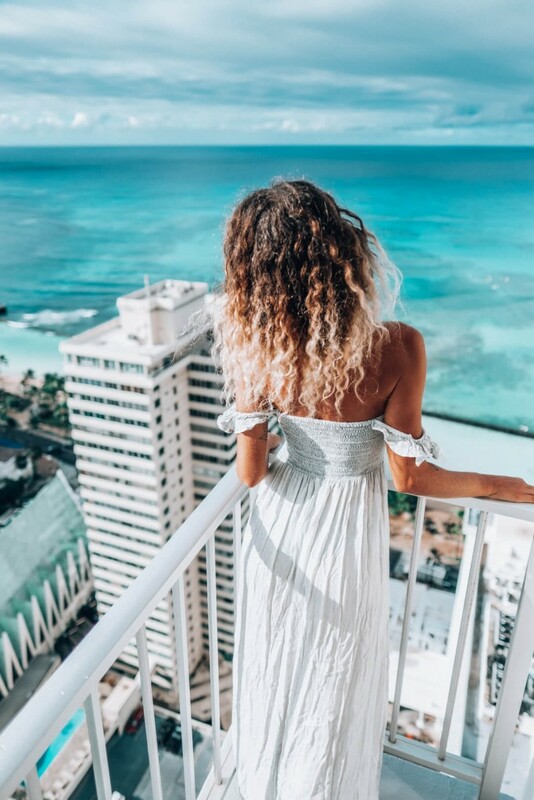 The views from your room are just incredible! Hope you had a wonderful time. I have traveled a lot in my lifetime, and i too cannot say what my favorite place is, each is unique in its own way. But I have never been to a resort like this one, it is divine.